Gizmodrome have announced that they will release their self-titled debut album later this year. 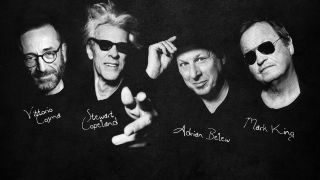 The all-star band consists of Stewart Copeland, Adrian Belew, Mark King and Vittorio Cosma, with the record scheduled for a September 15 launch via earMUSIC. One of the album tracks is called Strange Things Happen – and Copeland says the title is appropriate to the way the project came together. He explains: “Vittorio and I have been playing together for years in Italy, but it got serious when Adrian and Mark joined us for 15 days of wild creativity in a Milan recording studio. Further album details will be revealed in due course but a work in progress version of the track Amaka Pipa can be heard below.